All but a couple of the 16 Monster Energy NASCAR Cup Series Playoff contenders had to rally from “issues” in Sunday’s Playoff opener. There were spins, flat tires, pit road penalties, collisions and wall contact. 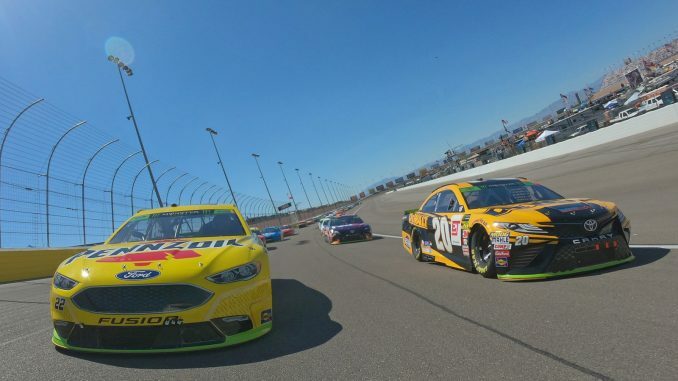 It was Las Vegas Motor Speedway after all – a 1.5-mile track to start the championship run in a city home to high-stakes and plenty of action. Sometimes more action than the NASCAR’s best even anticipated. Yet Kyle Busch – who spun through the infield grass late in the race – still managed to rally to a top-10 finish (seventh) and stay two points off the championship pace set by Martin Truex Jr. who finished third on Sunday. They were a couple of the fortunate ones. “If you would have taken the finish from 20 (laps) to go, it would have been a heck of a lot different finish than it is now – there was a lot of racing and a lot of chaos happening the last few restarts. Good for us, a couple of those cars having trouble and getting pushed to the back and things happening the way they were obviously helped us and got us farther up front. If it wasn’t for those, we probably would have been 16th or so. Kevin Harvick, a seven-race winner this season heading into Las Vegas, had a tire problem and ended up in the wall. Unable to avoid Harvick who crashed between Turns 1 and 2, Sunday’s polesitter and fellow Playoff driver Erik Jones ran into Harvick’s car. The drivers finishing 39th (Harvick) and 40th (Jones) in the 40-car field. And Jimmie Johnson, who had run among the top-five for much of the afternoon, had his car make contact with fellow contender Kurt Busch on a late restart, sending Johnson’s No. 48 Chevrolet into the wall. They both finished the race despite multiple trips to pit road – but were scored 21st and 22nd, respectively. And the hot temperatures – in the high 90s at the drop of the green flag – created a tougher-then-typical race physically as well.